Kaylor Knob is a fairly easy 3.5 mile ridge hike offering nice (but slightly obstructed) views. The summit is the highest point on Second Mountain. The rhododendrons and wild azaleas are starting to bloom. Below: The view was cloudy and hazy from Kaylor Knob. For those that regularly follow our blog, you may know that Christine sprained her ankle badly during our hike up Buzzard Rock. While she was healing, we participated in a Backpacking 101 course through PATC. The workshop concludes with an overnight backpacking trip scheduled for the first weekend in May. We decided to test out the ankle with some extra weight to see if going on the backpacking trip would even be possible. So, we got our gear together and decided to do a short hike to Kaylor Knob after work last Friday. While you can approach this summit from Cub Run, we decided to try the shorter approach, taking off from the overlook at Massanutten Resort. The hike starts across the road from the parking lot at the top of the overlook. We have hiked this trail several times to the first overlook where a geocache is hidden, but this was the first time that we took the hike to the summit. Since the last time we did this hike, someone has improved the trail markings. You simply follow the blue-blazed trail along the way (some points also have blue signs marked with a “K.K.” and the mileage). At around .5 miles, you will come to a junction with another trail that is marked with pink blazes. Just stay to the right and continue on the blue-blazed trail. At .75 miles, you will come to a small rock outcropping that has a nice view to the west. If you continue up the hill past this outcropping, you will continue to walk along the ridge. You will see views to the west and east through the trees that will open up at different spots. 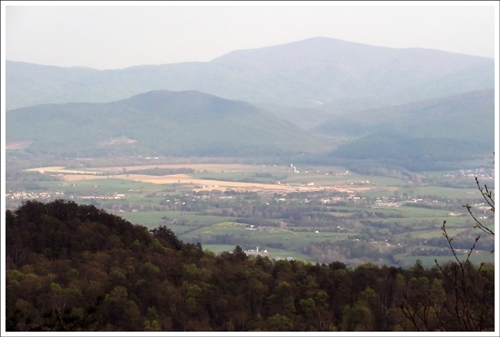 At 1.75 miles, you will come to the summit, which is marked with a larger outcropping and nice views toward Shenandoah National Park. There used to be a summit sign, but as of spring 2017, it’s gone! After taking some time to enjoy the views head back the way you came. Adam tries out the backpack. This is a great short hike to do if you’re visiting the Massanutten area. I managed to load about 25 pounds of gear into our backpack for the “dress rehearsal”. My ankle felt completely fine for the entire hike – stable and painless. The pack was easy to carry and comfortable. It did make the hills a little tougher, but I still felt really good. I know our packs for the trip will be a little heavier, but this was still a decent test. The Kaylor Knob hike is not particularly remarkable. It’s pretty and peaceful and has two nice viewpoints along the way. There are definitely more impressive trails in our area, but this one is a five minute drive from the house, so it was perfect for a quick after-work hike. The Kaylor Knob summit has a nice place to sit. Note: If you have a couple days in the area, be sure to check out the Massanutten Ridge Trail! Difficulty –1.5 Most people should be able to do this. Trail Conditions – 3. While the trail is used often, it contains lots of pointy rocks. Views – 2.5. Pretty, but not terribly open or panoramic. Wildlife –1.5 There isn’t much room for wildlife on the top of this ridge. Expect to see birds of prey soaring in view as well as many of the local birds in the thickets. Ease to Navigate –4.5. If you stay on the blue-blazes, you’ll be fine. Solitude –3. You may see some people due to its popularity with vacationers, but you should still have mostly solitude. Directions to trailhead: From Harrisonburg, head east on US 33 for about 10 miles. Turn left at the Exxon on the left and head on SR 644, Resort Drive. Follow this road and take a left on Massanutten Drive. You will reach a guard house. Let the guard know that you are here to hike and they will give you a guest pass. After about 3 miles, take a right on Del Webb Drive. Follow Del Webb Drive for about two miles until you begin to drive up to the ridge, where there is a parking lot on the left. After you park here, cross the road. At the end of the guard rail you will begin the Kaylor Knob trail.